Salil K. Das, Sc.D., D.Sc. Professor of Biochemistry. Earned the Sc.D. degree from Mass Institute of Technology, Cambridge, MA in 1966 and the D.Sc. degree from Calcutta University in 1974. After postdoctoral work at the University of Arizona, University of Arkansas and Duke University, he joined the faculty of Meharry Medical College in 1969, in the Department of Biochemistry. 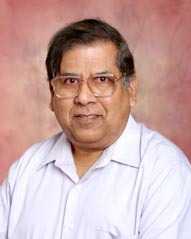 Dr. Das has been professor in that department since 1981. His research focuses on the elucidation of molecular mechanisms of pulmonary diseases (ARDS, COPD and cancer) and breast cancer associated with environmental toxicology. These studies include (a) reactive oxygen species - mediated signal transduction pathway, (b) expression of regulatory enzymes in phospholipid metabolism, and (c) role of mediators of vitamin A action, beta-adrenergic and translocator protein in cancer. Our main research focuses on the regulation of the biosynthesis and secretion of lung surfactant phospholipids. These include studies on (a) the subcellular targeting, purification and cloning of cholinephosphotransferase, the terminal enzyme for the synthesis of phosphatidylcholine, and cloning of its gene; (b) the role of phospholipids in cancer, (c) the role of ï¢-adrenergic and translocator protein (TSPO) as well as Ca2+-dependent phospholipid binding proteins on the secretion of surfactant by alveolar type II cells. A second research focuses on the elucidation of the role of TSPO in the development of breast cancer. Our ultimate goal is to develop therapeutic approach for the prevention of breast cancer. In this regard, we are studying the molecular mechanism by which soybean protein exerts it breast cancer preventing effect by modulating the expression of the TSPO gene. Another research focus in our laboratory is on the development of animal model for airway hyper reactivity (asthma), Adult Respiratory Distress Syndrome, pancellular toxicity and lung injury in general by environmental toxicants. These involve studies on the harmful health effects of mainstream and passive smoking, toxic oil, cadmium, chemical warfare agents (mustard gas), and lethal toxin. We are presently exploring the signal transduction pathways by which lung injury is initiated by accumulation of reactive oxygen species. 1. Das, S. K., Attempt to Isolate Glucose 6 Phosphatase from Goat Liver Microsomes, M.S. Thesis, Calcutta Univ. 1961. 2. Harris, R. S., Das, S. K. and Nizel, A. E., The Cariostatic Effects of Three Types of Phosphates when Fed Singly or in Combinations in Diets of Rats, J. Dent. Res. 43: 857 858, 1964. 3. Harris, R. S., Das, S. K. and Nizel, A. E., Cariostatic Effects of Three Types of Phosphates when Fed Singly or in Combinations in Diets of Rats, J. Dent. Res. 44: 549 553, 1965. 4. Das, S. K., Factors Affecting the Fatty Acid Composition of Teeth, Sc.D. Thesis, M.I.T., 1966. 5. Das, S. K., Doberenz, A. R. and Wyckoff, R. W. G., The Lipids in Fossils, Comp. Biochem. and Physiol. 23 : 519 525, 1967. 6. Das, S. K. and Smith, E. D., Fatty Acids in Fossil Algae of Different Geologic Ages, Annals of New York Academy of Sciences, Article 10, 147 : 411 418, 1968, Accepted by the New York Academy of Sciences for A. Cressy Morrison Award For Natural Science (1967) (Award Received at 150th yrs. Celebration of the Academy on December 6, 1967). 7. Das, S. K. and Harris, R. S., Fatty Acids in Tooth Lipids of Sixteen Animal Species, J. Dent. Res. 49 : 119 125, 1970. 8. Das, S. K. and Harris, R. S., Lipids and Fatty Acids in Fossil Teeth, J. Dent. Res. 49 : 126 130, 1970. 9. Das, S. K., To Improve the Method of Evaluation of Caries by Colorimetric Technique Using Sudan III., The Meharry Dent. 35: 18 21, 1972. 10. Das, S. K., Abernathy, J. L. and Quin, L. D., 1 Deoxy 1 (2 phosphonoethylamino) D Fructose, an Amadori Rearrangement Product from 2 Aminoethyl Phosphonic Acid, Carbohydrate Research 30 : 379 380, 1973. 11. Das, S. K., Zelman, A., Adhikary, P. K. and Rhodes, R. S., Study on the Effects of Prostaglandins on Oxygen Saturation of Normal and Sickle Cell Erythrocytes, Proc. of the First National Symposium on Sickle Cell Disease, DHEW Publication No. (NIH) 75 723, 243 244, 1974. 12. Das, S. K., Paleobiochemical Studies of Fossils in Relation to Lipids and Fatty Acids, D. Sc. Thesis, Calcutta University, 1974. 13. Das, S. K. and Harris, R. S., Effects of Dietary Restriction on the Composition of Lipids of Rat Teeth, Archs Oral Biol. 20 : 131 135, 1975. 14. Das, S. K., Foster, H. W., Adhikary, P. K., Modi, B. B. and Bhattacharyya, D. K., Gestational Variation of Fatty Acid Composition of Human Amniotic Fluid Lipids., Obstet. Gynecol. 45 : 425 432, 1975. 15. Das, S. K., Foster, H. W. and Bhattacharyya, D. K., Gestational Age Assessment by Estimation of Palmitic Acid Content of Amniotic Fluid Lecithin, IRCS J. Med. Sc., Vol. 3, No. 4, p. 175, 1975. 16. Das, S. K., Effect of Alloxan Diabetes on the Histochemistry of Rabbit Retinal Nuclear Layers, IRCS J. Med. Sc., Vol. 3, p. 384, 1975. 17. Das, S. K., Scott, M. T. and Adhikary, P. K., Effect of the Nature and Amount of Dietary Energy on the Lipid Composition of Rat Bone Marrow, Lipids, Vol. 10, No. 10, 584 590, 1975. 18. Das, S. K. and Harris, R. S., Effect of Dietary Supplementation of Glycine on Caries Development and Lipids of Rat Molar Teeth, J. Dent. Res., Vol. 54, 987 992, 1975. 19. Das, S. K., Review of the Book \"Affinity Chromatography\" by R. R. Lowe and P. D. G. Dean, John Wiley and Sons Publishers, New York, 1974 in J. Am. Chem. Soc. 97, 5645, 1975. 1. Stone, W., Mukherjee, S., Smith, M. and Das, S. K. The Therapeutic Use of Antioxidant Liposomes. In: “Liposomes-Methods & Protocols: Methods in Molecular Biology” (Series Editor: J. M. Walker; Vol. Editors, S. Basu & M. Basu), Humana Press, New York, Vol. 199, pp 145-161,2002. 2. Mukherjee, S., Chatterjee, D. and Das, S. K. Cholinephosphotransferase. In: Glycerolipid Metabolizing Enzymes (Volume Editors: D. Haldar and S. K. Das), Research Signpost Publishers, 37/661 (2), Fort P.O., Trivandrum, Kerala, India, 1-147, 2002. 4. Chatterjee, D., Mukherjee, S., Smith, M. G. and Das, S. K. Role of Sphingomyelinase in the Environmental Toxin Induced Apoptosis of Pulmonary Cells, LIPIDS: Sphingomyelin Metabolizing Enzymes” (Volume Editors: D. Haldar and S. K. Das), Research Signpost Publishers; Trivandrum, p. 117-139, (ISBN: 81-7736-229-1), 2004. 5. Chatterjee, D., Mukherjee, S. and Das, S. K., Involvement of Signal Transduction Pathway in Mustard Gas Induced Lung Injury. In: Radiobiology and Bio-medical Research (Ed. K. P. Mishra), Narosa Publishing House, New Delhi, 109-118, 2004.